Moses Landes, my second great grandfather, migrated from Romania to North America, and his sons also followed a similar path at different times. While Moses traveled through Liverpool, my great grandfather, Joseph Landes, traveled through Hamburg. Within a few years, they were reunited in Montréal first, then New York City. 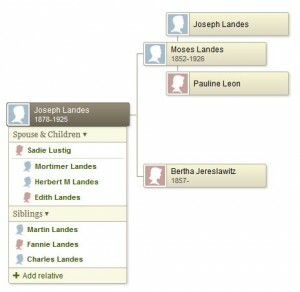 I’ve written more details about the Landes family history here. Using Google Maps, I’ve highlighted the important locations — residences and ports — for these Landes ancestors. Because I still haven’t determined some city and town details prior to immigration, when only a country name has been confirmed, the location in the map is Google’s center marker for that country. 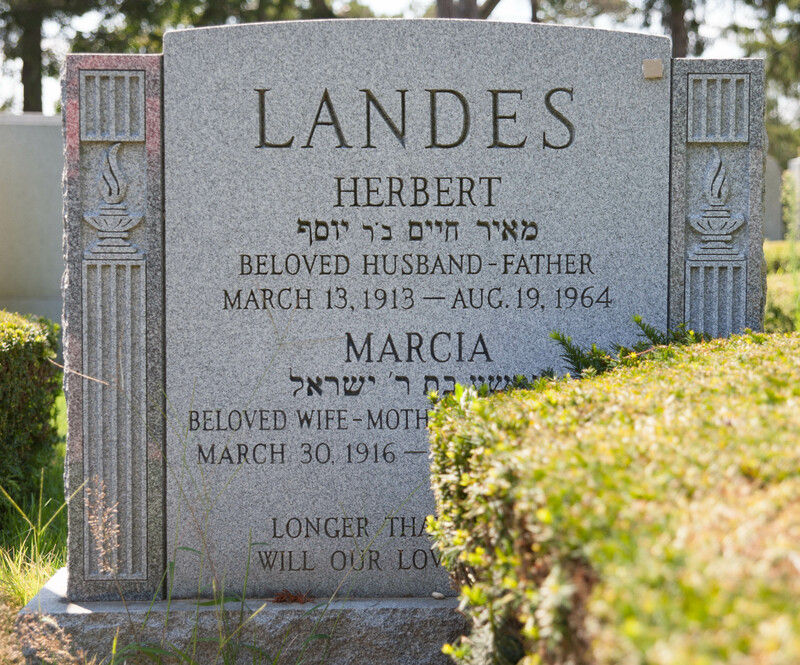 The timeline extends from the birth of my second great grandfather to the death of my grandfather, Herbert Landes. The map is fully interactive. Note: this map will not be visible in email or on other sites. If you don’t see the map included in this article, visit the article on its home on the Landes Family Tree Research website. National Library Week is celebrated across the country from April 13 through 19, 2014, and ProQuest has been providing free access to several of their popular databases. I still have access to ProQuest through my former graduate program’s website, but I found ProQuest’s own tools to be much more successful. In particular, ProQuest’s obituary database, which includes more than 10.5 million obituaries and death notices, has helped me quickly find information about my relatives without searching through thousands of pages on microfilm. The search facility seems to be much better than what I’ve previously used, as the results for similar searchers were much more plentiful and relevant through ProQuest’s own interface. 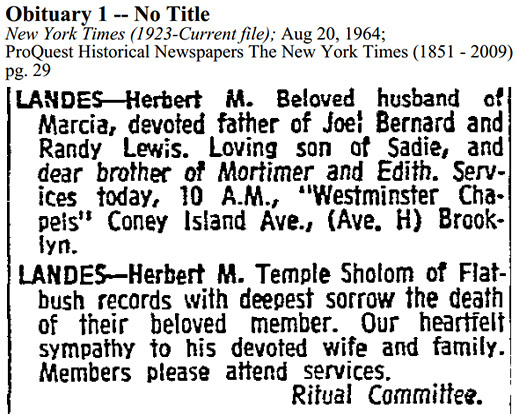 Most notably, I found obituaries for my grandfather, Herbert Landes, and great grandfather, Joseph Landes. Although these notices appeared in the easily-searchable New York Times, I hadn’t come across them until now. Note that the New York Times obituary for Joseph Landes includes yet another, different, mistake regarding the name of the landsmanschaft with which he was involved. The Practical Druggist and Pharmaceutical Review of Reviews called the organization “First Berauer, K. N. V.” in its announcement of Joseph’s death; the New York Times gets farther from accuracy with “First Berzuer K. N. V.” The organization should be listed as “First Bacauer K.N.V.” I imagine type typesetters and typists were not very familiar with these organizations. If you try to visit this link directly, without viewing the National Library Week page first, you will be required to log-in using your ProQuest access credentials. The only way to view the database for free this week is through the National Library Week page. So far, I have found more than 25 death notices and obituaries using this free database, many of which I wasn’t able to find using my regular ProQuest account. The obituaries that I’ve found for potential relatives have been helpful in identifying more of their family members, and might someday be helpful in connecting the dots between my confirmed relatives and others who I suspect are closely related. 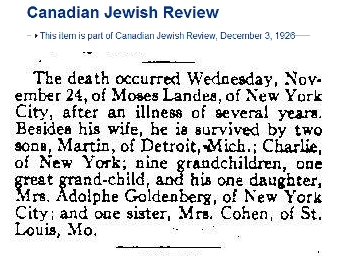 On December 3, the Canadian Jewish Review published a death notice or obituary for my second great grandfather, Moses Landes. Moses found his way from Iași, Romania to Montréal, Canada to New York City. And although he was living in New York City when he died in 1926, he still had family ties to Montréal, where his son Martin was working as a salesperson. A month after Moses’s death, Martin was naturalized in the United States. The Canadian Jewish Review often shared the social comings and goings of the community. It was the Facebook of its day, where everyone in society would let the rest of the community know about their travels, their parties, and their major life events. Here is the death notice published about Moses Landes. The death occurred Wednesday, November 24, of Moses Landes, of New York City, after an illness of several years. 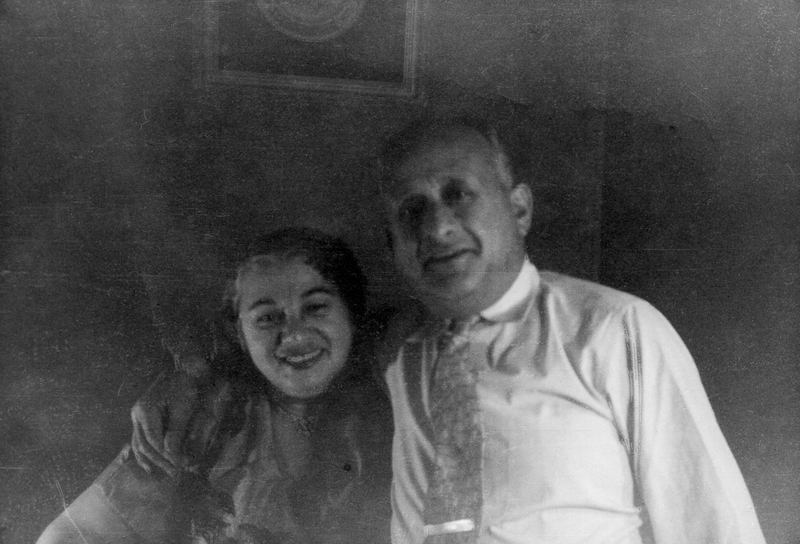 Besides his wife, he is survived by two sons, Martin of Detroit, Mich.; Charlie, of New York; nine grandchildren, one great grand-child, and his one daughter, Mrs. Adolphe Goldenberg, of New York City; and one sister, Mrs. Cohen, of St. Louis, Mo. My great grandfather, Joseph Landes, died in 1925; Bertha Brauna Yeruslavitz Landes, my second great grandmother and wife of Moses, died in 1927. I still have not been able to determine the identity of the sister of Moses Landes. 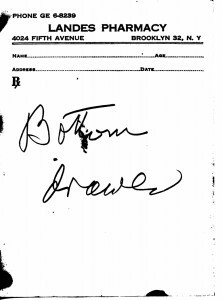 I’ve searched through all of the publicly-available St. Louis city and county death certificates after 1926 for women with the last name Cohen, and I haven’t found one that is definitively a daughter of Joseph Hersh Landes and Perla Leah. 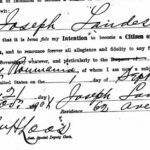 According to his naturalization documents, my paternal great grandfather, Joseph Landes, arrived in the United States on 1 Sep 1899. A search on Ancestry.com revealed a Josef Landes, a 21-year-old Romanian student born in Iași, who departed Hamburg on 20 Aug 1899 on the ship Palatia. This must have been a recently indexed document because the search result did not look familiar to me. The Hamburg passenger lists do not contain many details, but everything presented makes it likely that this record pertains to my great grandfather. 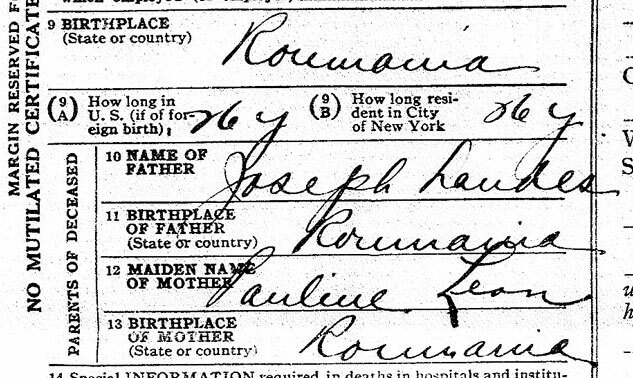 By April 1901, Joseph was living with his parents and siblings in Montréal, Canada. But he lived there for only a short time; by November that same year, he had a residence in New York and was declaring his intention to become an American citizen. Until now, I had not found an Ellis Island immigration record for Joseph, but now potentially with the name of his vessel, I could browse through the images on Ancestry.com. Many of these immigration records have not been indexed, so research requires looking through the manifest page by page. 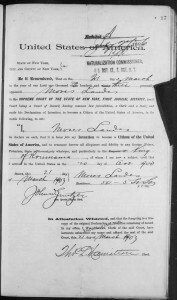 After some browsing, I found the record for the Joseph Landes who arrived in New York on 1 Sep 1899 on the ship Palatia. The record obviously pertains to my great grandfather. 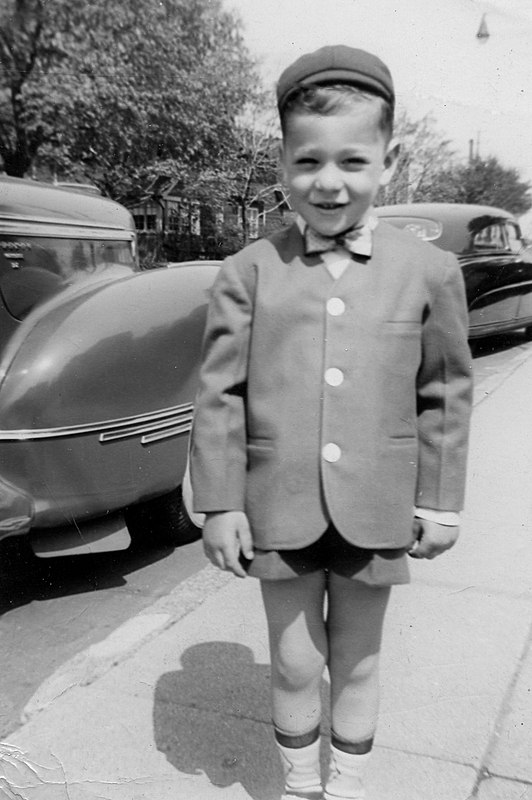 It indicates Joseph is a medical student heading to Montréal, where his brother Martin Landes is waiting for him. Everything adds up. 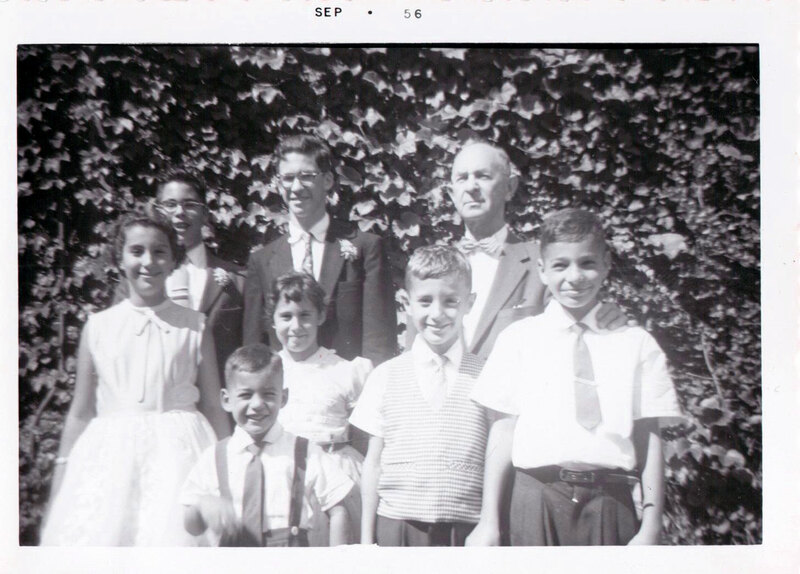 As a result, I have some more thoughts about the experience of my Landes ancestors. 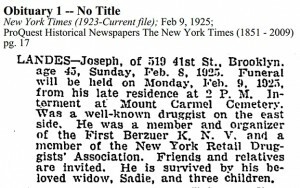 I noted previously that Joseph was a pharmacist and that he was an organizer for the landsmanshaft First Bacauer, K.U.V. It seems likely that Joseph, now confirmed to have been born in Iași like his siblings, studied pharmacy in Bacău until he was 21. At that point, he joined the rest of his family in North America. 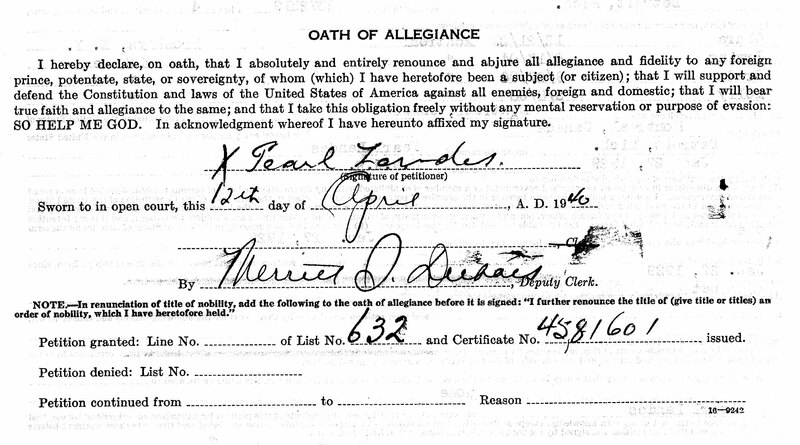 Joseph Landes’s immigration details were missing from my records, so this find is particularly satisfying. 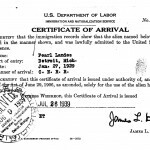 I still have many questions about my ancestors, and after this discovery, I may find myself spending more time looking for missing immigration records by browsing the images of the record books page by page. With the indexing of the Canadian Census of 1920 now complete on Ancestry.com, I was able to find the family of Martin Landes, my great grand uncle. 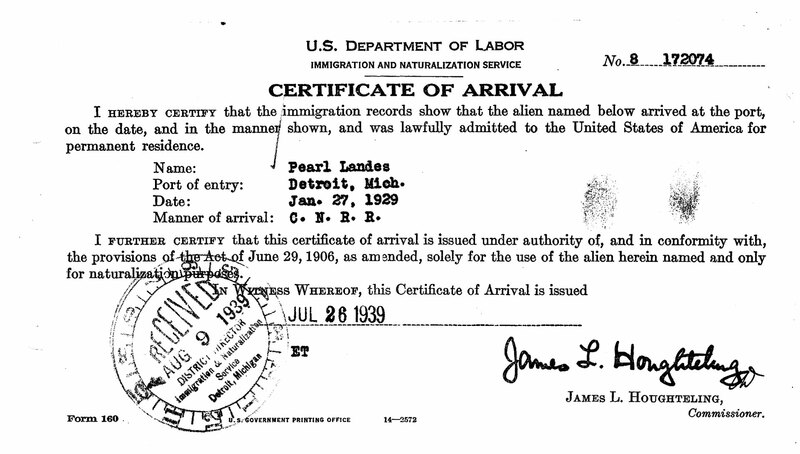 He was a traveling salesman who split his time between Detroit and Montreal, eventually moving to Detroit permanently and gaining his U.S. naturalization. The 1921 census raised more questions. I’ve already identified children of Martin who were not included in the oral family history eventually written down by my grand uncle Mortimer and his sister Edith. I wrote last year about finding a birth record for Isack Landes in a collection of synagogue birth records from Montreal, the Drouin Collection on Ancestry.com. Since then I’ve also found a birth record for Lillie Landes in the same collection. Because the birth records list the parents’ names, I can be sure these are the children of Martin Landes. Lillie shows up in the Canadian Census of 1911, as does another son of Martin, Isadore. Does Isadore refer to Isaac (Isack) or Irving, a known son of Martin? The ages in the census don’t help. In 1921, the Canadian Census includes listings for Isidore, Urbain, and Ruthy in addition to the other known children of Martin, Clara, Grace (Grada) and Molly. If Urbain is simply a mishearing of Irving, that would mean Isadore refers to Isaac. Ruthie could refer to Lillie. Now, it’s likely that Isaac and Lillie died young because those names were never known to Mortimer. Furthermore, there is an interesting Jewish tradition where the names of sick children are changed, superstitiously, to try to avoid death’s arrival — to trick death. Isadore could be the boy born Isaac and Ruthie could be the girl born Lillie. But that presents a new question: where is Irving in the Canadian Census in 1911? 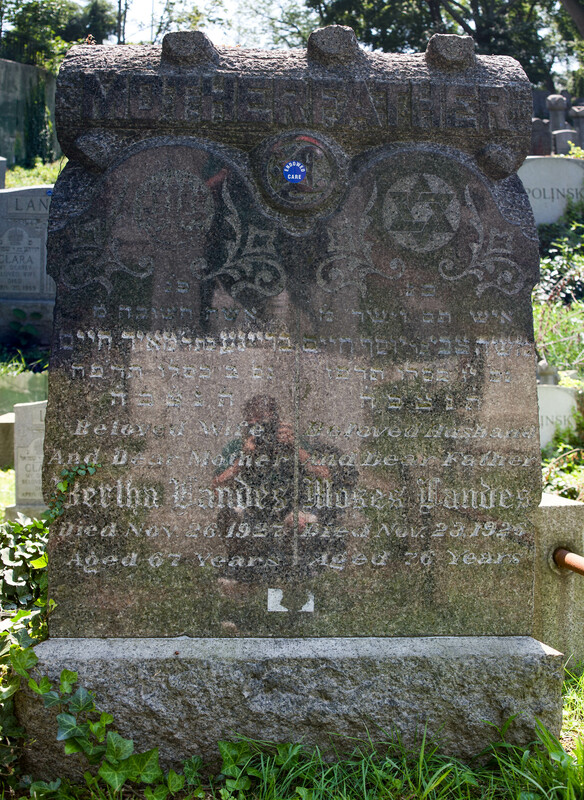 With the assumption that Ruthie refers to the girl born with the name Lillie, there is a Ruthie Landes buried at Back River Memorial Gardens Cemetery in Montreal, with a reference to the Beth David synagogue, which is the same synagogue that holds many of the Landes children’s birth records. This same cemetery is the home to other, more distant relatives. There is no date on this record, so it might be worth a call to the cemetery to find more information. 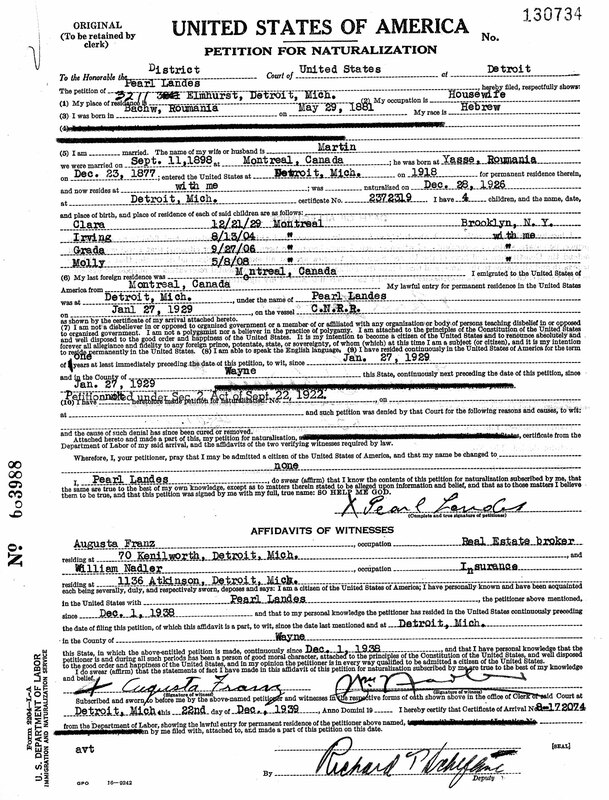 I have not yet found a birth record for Irving Landes, but on at least one occasion, Irving’s birth date is listed as the actual birth date that’s is confirmed for Isack. In other sources, Irving’s birth date is only a few months after Isaac’s, which would be impossible. The birth dates of Isaac and Irving aren’t consistent — in fact the birth dates of all of Martin’s children are mostly inconsistent throughout their lives — so it is even more difficult to make sense of this family. At least two generations of the Landes family were involved in the pharmacy industry in New York City. 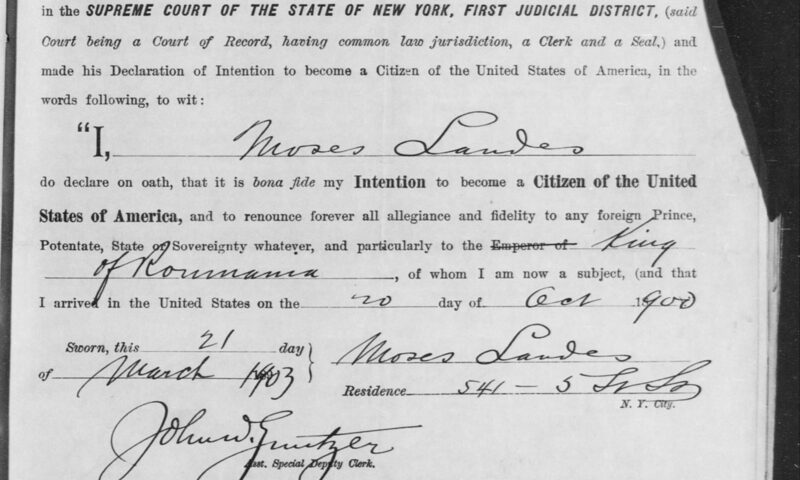 When Moses Landes settled in Manhattan after passing through Canada on the way from England and initially Romania, he noted his occupation has a stand keeper, and on his death certificate, he was listed as having worked at a candy store. But just a couple of years after he was living in New York, his son Joseph was moving forward with his career. Joseph’s work continued with his son Herbert, and for a time, with his other son Mortimer. On May 21, 1902 at Brooklyn College, Joseph Landes passed the examination given by the Eastern Branch of the (New York) State Board of Pharmacy for the degree of licensed pharmacist and received his pharmaceutical certificate. 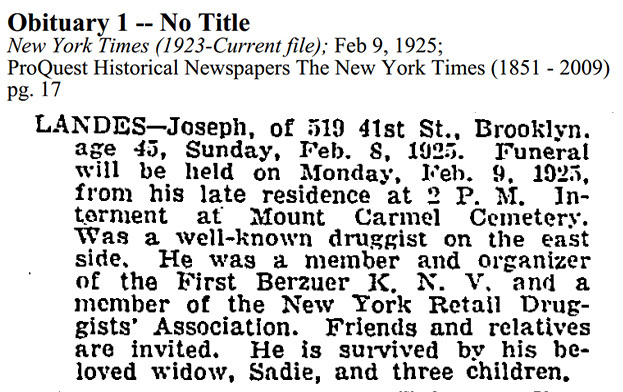 By March 1910, Joseph, living in Manhattan, was working as a pharmacist at 11 First Avenue, also in Manhattan. He was operating his store under the registered trade name Alo-Lax Chemical Company. He was also later a director and vice president of Sealeaf Emulsion Company, which was, probably after Joseph’s involvement, fined $50 for advertising unproven health benefits of a chocolate cod-liver oil product. Joseph Landes who conducted a drug store at 41st Street and Fifth Avenue, Brooklyn, died recently aged forty-five years. He was well and favorably known to the drug trade as treasurer of the Bay Ridge Retail Druggists Association and as member of the New York Retail Druggists Association. 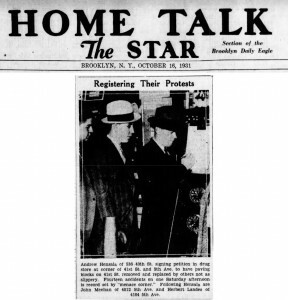 He was also a member and organizer of the First Berauer, K. N. V. [sic] He is survived by a widow and three sons. I’ve come to the conclusion that the printing of “First Berauer, K. N. V.” was probably a misreading of First Bacauer, K.U.V., the organization (landsmanshaft) that supported — or was intended to support — immigrants from Bacău, Romania, as well as relatives still living there. K.U.V. is an abbreviation for the Yiddish that translates roughly to “sick and benevolent association.” This would therefore mean that Joseph considered himself to be from the town of Bacău in Romania, and possibly that he and his siblings lived there before emigrating to North America by way of England. 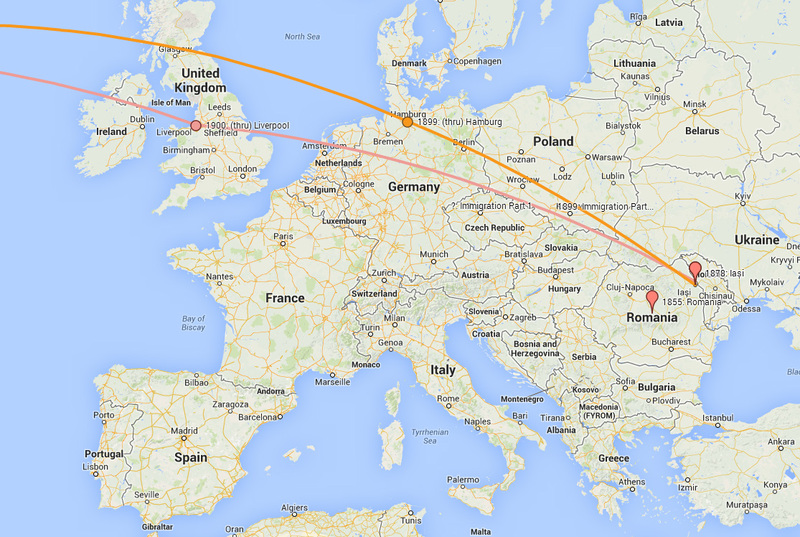 It’s likely he was born in Iași like his brothers and sister, but perhaps he identified his childhood with Bacău. First Bacauer K.U.V. did not pay for his burial or the burial of any other Landes, but at first glance, the organization did not seem to have any money. 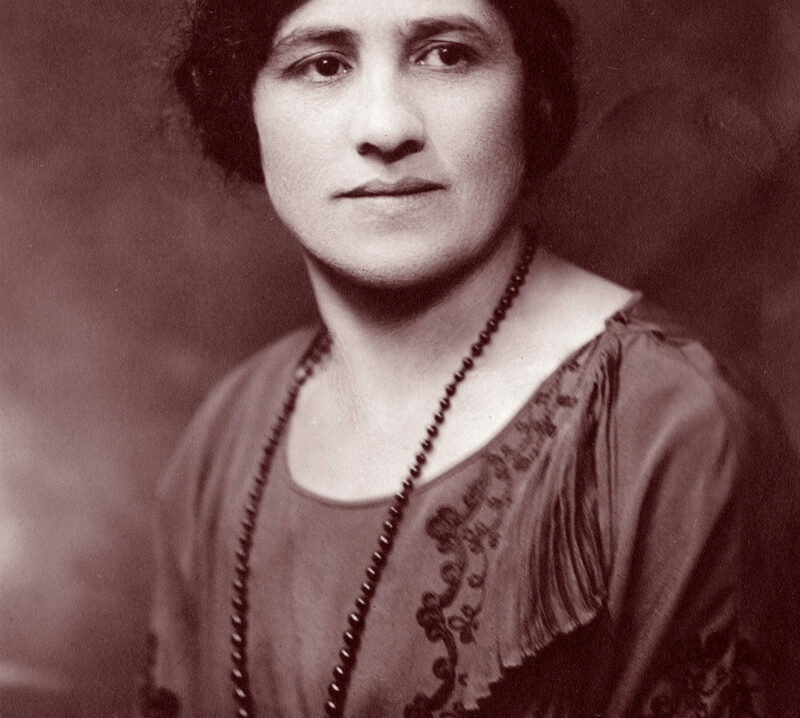 Joseph’s widow, Sadie Lustig Landes, was the proprietor of the store after Joseph’s death, and Herbert and Mortimer later operated or worked at the store. After Sadie passed away in 1964, it appears that the family sold the business. The store that contained the pharmacy became known as Bi-Rite Drugs after the new owners filed for incorporation with New York State on 17 May 1965. Bi-Rite moved between 1997 and 2007 to its final location at 4013 Fifth Avenue, and today, Bi-Rite Drugs is out of business. Towards the top of this post is a page from the prescription pad from the Landes Pharmacy, provided by Joan Landes Norton who discovered the paper deep in a file cabinet. You can see the store’s phone number is GE 6-8239, the same number (718-436-8239) that stayed with the store for at least fifty years, even after the store changed locations and owners following the death of Sadie Lustig Landes. The photograph here is how the storefront appeared in 2013, courtesy of Google Maps Street View. Even in this photograph, if you look at the bottom of the sign noting the storefront is available for rent, you can see the last few digits of the same phone number that stayed with the store since the Landes family arrived in Brooklyn. 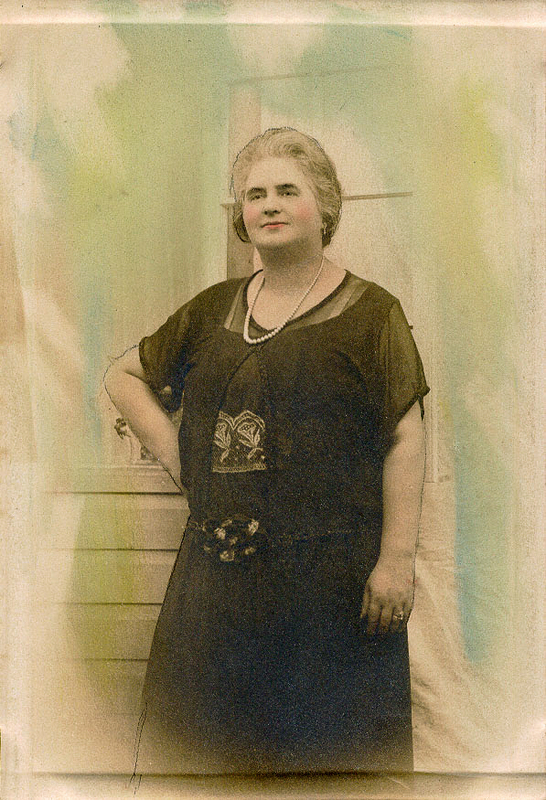 Fannie Landes, daughter of Moses and Bertha, married Albert Paltiel from Canada in 1907. 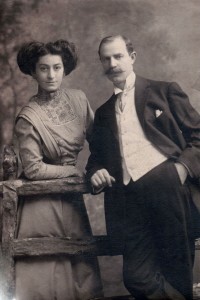 Fannie and Albert had two children, Joseph and Harry, before Albert passed away in 1909. Five years after Albert passed away, Fannie remarried, and her new husband, Adolph Goldenberg, helped raise the children. The information I have about the Paltiels of this generation came from the family history written by my grandfather’s brother, Mortimer (“Morty”) Landes, as well as a family tree document provided to me by my father. 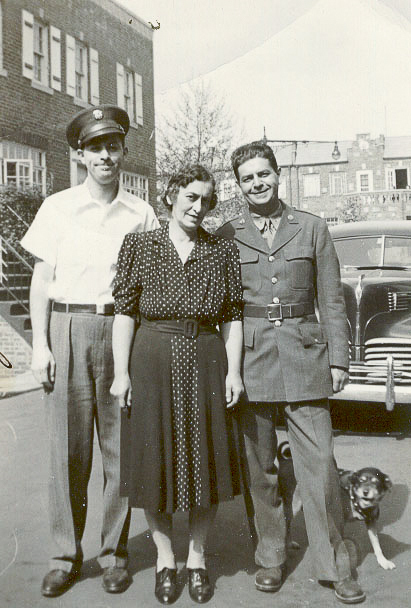 The information led to census listings and a search for likely marriage certificates. 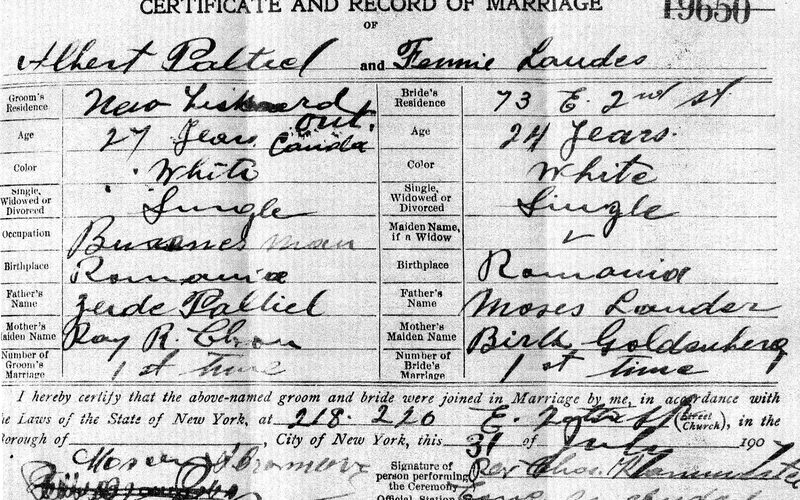 The certificates for Fannie’s two marriages arrived earlier this week, and I’m relatively confident the certificates pertain to the Fannie Landes who is my great grandfather’s sister. Yet, there is still some confusion surrounding Fannie’s mother’s maiden name. 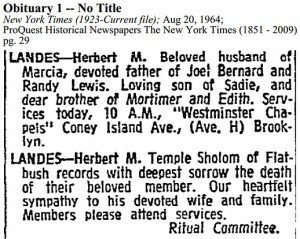 I mentioned that on the death certificate for Bertha Landes, her father and mother are listed as Martin Goldenberg and Bertha Goldenberg. 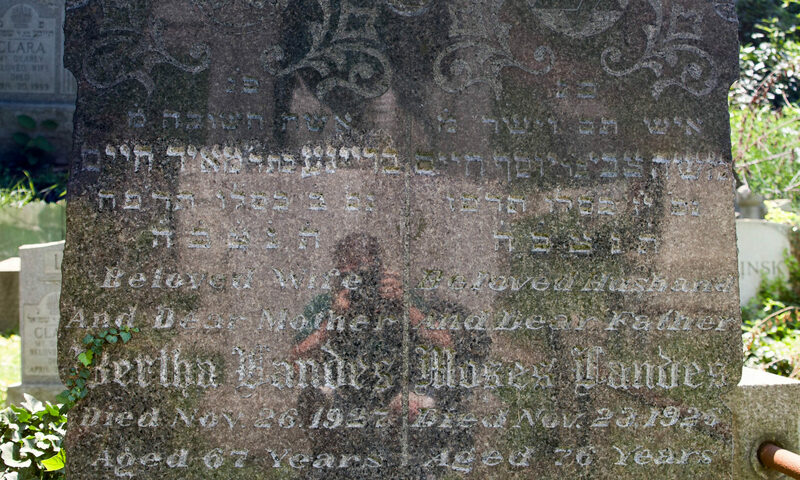 Goldenberg is the last name of Bertha’s son-in-law, Adolph, the second husband of Fannie, so my first assumption was that Adolph might have reported the information incorrectly. I previously had information indicating Bertha’s maiden name is Jereslawitz. 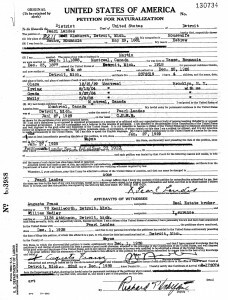 Both marriage certificates received this week for Fannie Landes, like Bertha’s death certificate, contradict what I thought I had known. 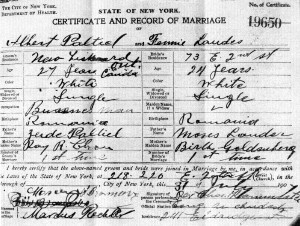 The first marriage certificate, for Albert Paltiel and Fannie Landes pictured above, lists Fannie’s parents as Moses Landes and Birth (I’m assuming this should be Bertha) Goldenberg. 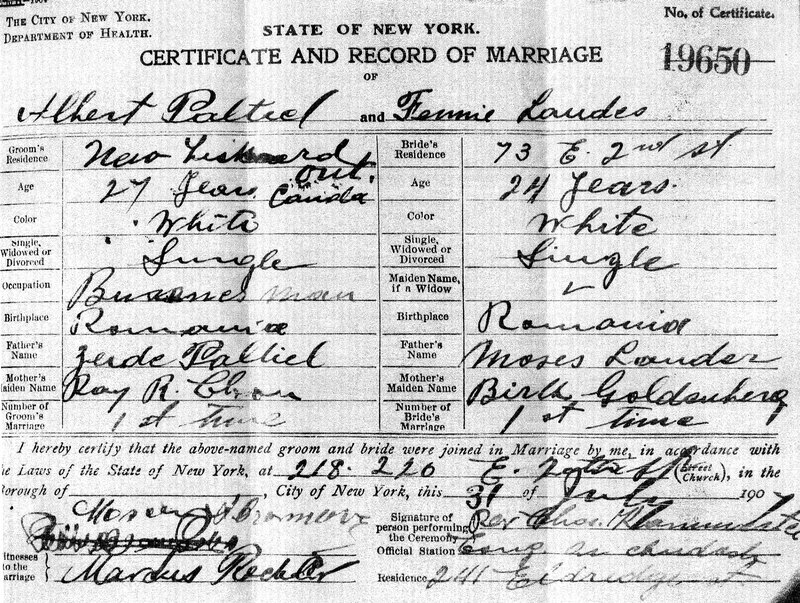 The second marriage certificate, for Adolph Goldenberg and Fannie (Landes) Paltiel pictured below, indicates Fannie’s parents’ names are Moses Landes and Bertha Goldberg. 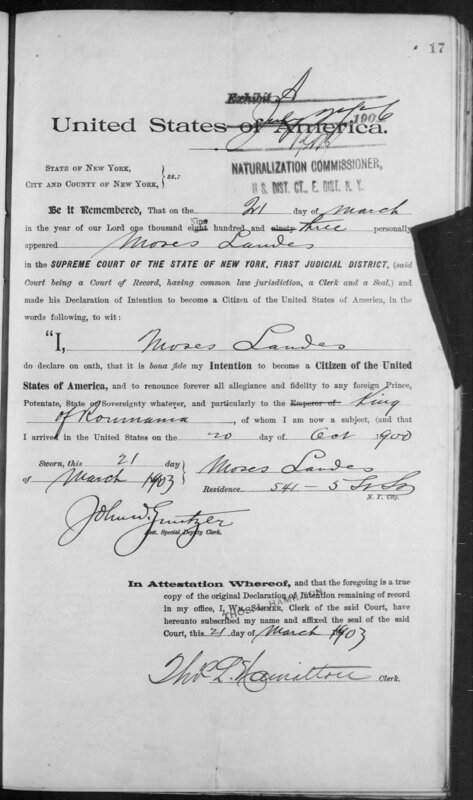 When I first started using Ancestry.com to search historical records for my ancestors, I came across naturalization index records for Moses Landes. The only pieces of comparable information were an approximate birth date and the occupation listed as “standkeeper.” These didn’t match closely enough to any other information I had in order for me to conclusively say that the index records pertained to my second great grandfather. I made a note of the index and moved on. Now with access to Fold3, I searched that site for additional naturalization records for Moses. 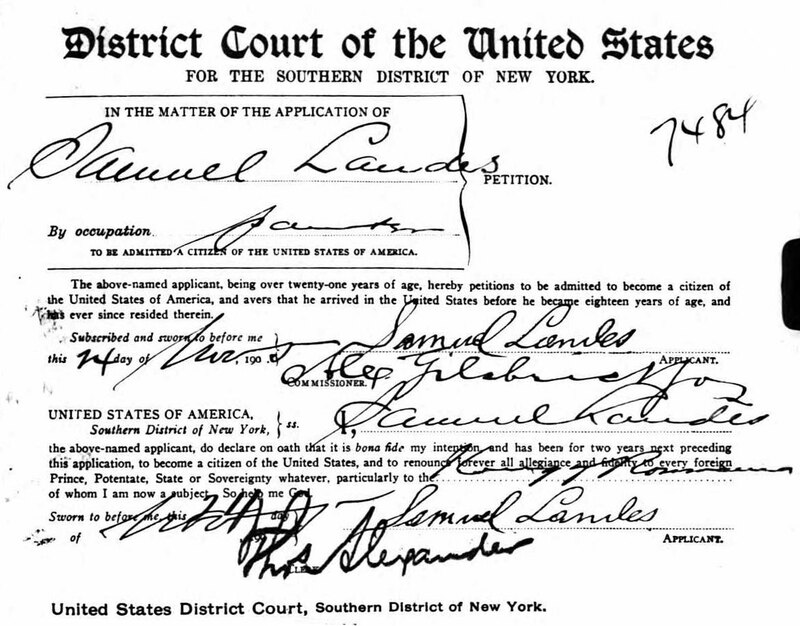 Fold3 has digitized more full naturalization records, whereas in many cases for New York City, Ancestry.com only offers indices. The full petition for naturalization included a familiar address, but it was off by one house, and it would be Moses’s children who lived there several years later. 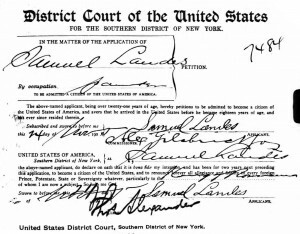 The declaration of intention, however, filed a few years before the petition for naturalization included yet another address, 541 5th Avenue in Manhattan. Realizing I hadn’t yet tracked down the 1905 New York state census record for Moses and his children, I used the Family History Library’s familysearch.org to try again to find this record. I found the family indexed under “Landers,” a common misspelling. 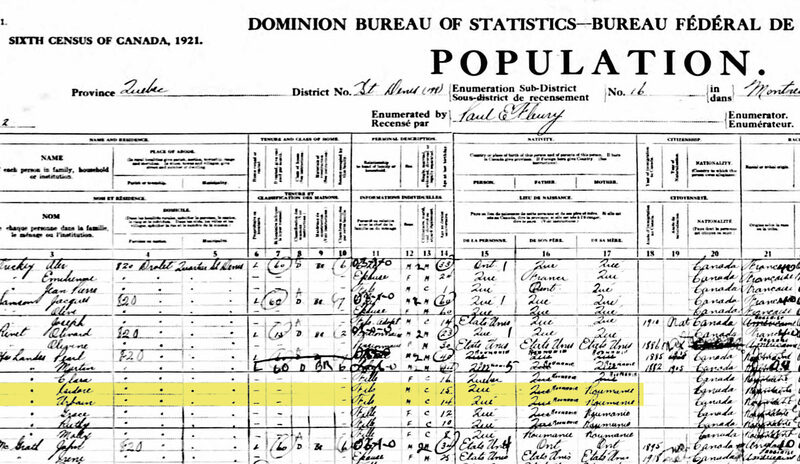 The address on the census record from 1905 matched the address on the declaration of intention for 1903. 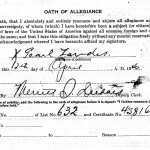 Putting all of the above together, I’m confident the naturalization records pertain to my second great grandfather, and I’ve added the information as sources to my family tree on Ancestry.com. 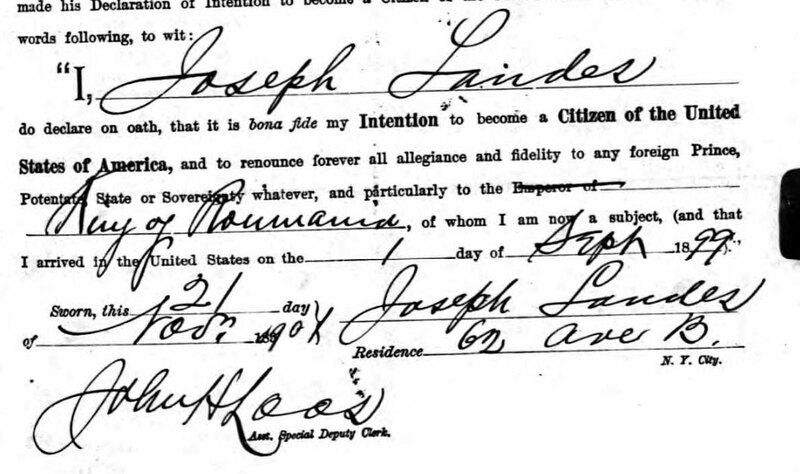 This has given me a more accurate birth date (Dec 1852 rather than about 1851), the date of naturalization, and definitive residential addresses for Moses and the rest of his family. It has also provided the date on which he arrived in New York, 20 Oct 1900, but according to the 1901 Census of Canada, he is later living in Montréal. 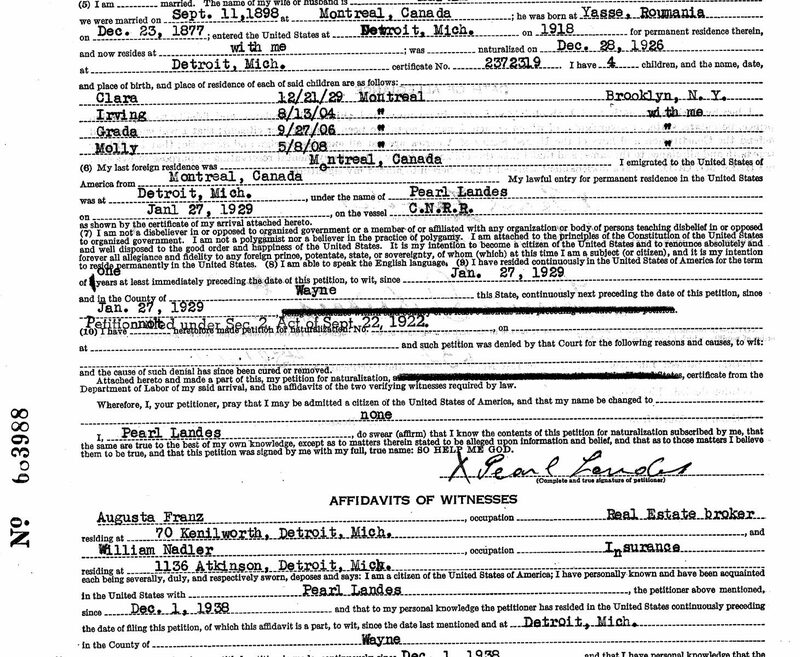 The Canadian immigration records state Moses immigrated to Canada in 1900. The question remains about whether Moses, and possibly part of his family, lived in both Canada and the United States at the same time.